Dave Hanron - The Business Outsource Guy: How Long Should You Wait on Hold? How Long Should You Wait on Hold? I hear the comments every day…..”You won’t believe what happened to me yesterday!” …. “I waited almost 40 minutes to get through” ….”You’d think they’d hire more people to answer the phones”….” I can’t believe I waited that long only to get transferred”…”That’s the last time. I’m moving my business”.....… and so on. Granted, working in the communications industry, I might be exposed to more of the complaints than the average worker but it is certainly a sore spot when someone has a poor experience with a company’s customer service organization. 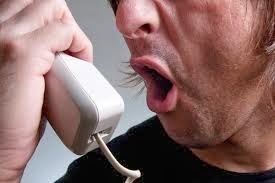 We’ve all made that dreaded call during our lunch hour to try and ask a question about something, maybe your cell phone, your cable bill, insurance bill, or even in the worst cases, the calls to file for unemployment benefits or Cobra insurance coverage. I personally have had loads of these experiences, with some hold times exceeding an hour. And that is FRUSTRATING. Take a look at a couple of these examples of hold times from CBC News….. Shocking, huh? Not really. I actually would argue that the time to get a resolution is actually longer. How many times do you get transferred and put back into the queue? Something to think about? We each have tolerances in our business in order to balance operating costs with customer satisfaction. The discussion here is what level of hold time are you willing to accept before you start losing customers? And as hold time goes up, you WILL LOSE customers. That’s a fact. I have seen many statistics pop up over the years to measure hold time. “ATA” or “Average Time of Answer”, “AHT” or “Average Hold Time”, “TIQ” or “Time in Queue” are just a few that come to mind. I actually use this statistic as a major selling point. My feeling is providing a service with little or no hold time presents a professional solution and portrays a service orientated company. If the operations of a firm are designed around short hold times, it means the company cares about its customers and will go to any means necessary to deliver a first class customer experience. This is the type of company where I want my business to go. Where do you put your business and why? Do you think hold time affects customer retention rates? Let’s find out what we all think……. …….And just for the record, my company, Granite Telecommunications, answers all customer service calls with a live person on average in less than 8 seconds 24x7x365…….. Instructing the most effective as well as the cleverest on this fearless " new world " will need a brand new along with improved upon academic paradigm. Permitting your academic resources to be able to age in the spot on the class is definitely the blunder which will expense people your future. smartcustomwriting.net for all kind of papers writing and it is very essay from others any writing service providers. What Makes a Good Vendor?